No, I haven't been eaten by an alligator...in case you're wondering. I have been researching the life and music of Ida Goodson who was a barrel house blues pianist from Pensacola Florida. Ida was the youngest of seven sisters, six of whom survived into adulthood. All six were musicians who played the Gulf Coast Highway from the 1920's. They were Wilhelmina, Edna, Sadie, Mabel, Molly, Della, and Ida. Ida played piano in most of the gulf Coast clubs around Pensacola including the 506 Club. 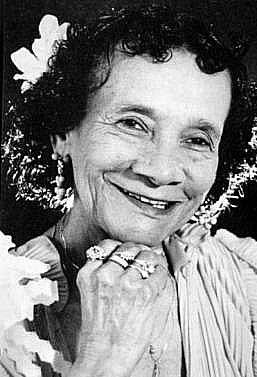 Ida also performed at the Florida Folk Festival later in her life and received a Folk Heritage Award in 1987. Ida was born in Pensacola, Florida in 1909 and grew up in and played most of her life around the Pensacola area. Her father and mother both played piano and her father was a deacon in the Mt. Olive Baptist Church in Pensacola. He was also a railroad man and had a run on the L & N railroad from Pensacola to River Junction outside of Chattahoochee. She passed away in 2000.
not much has been written down about her life and times. Her sister Wilhelmina known as Billie Pierce moved to New Orleans and married the blind musician DeDe Pierce. They played music in New Orleans for many many years, notably as the Preservation Hall Jazz Band. Sadie Goodson married a musician as well and moved eventually to Detroit, my home town. Ida was a diminutive and very vivacious woman with a wonderful stage presence. Dear pfg, here's a possible research source for you: google "lewis porter jazz"; his email address is lpjazz@gmail.com. Also, Lewis Porter interview. Going to the Florida Photographic Collection and searching on "Ida Goodson" gets you 83 photos. These don't show up in a general search in the State Archives of Florida Online Catalog. I am Ida's great niece. Sadie was my grandmother. I am trying to find out info about their parents, their names and photos... If you have any information, please, contact me at beryl.benbow@gmail.com. Thank you. Thank you for preserving my families history. 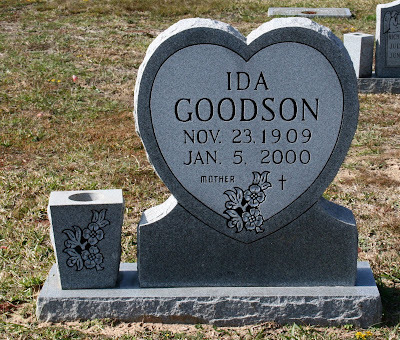 I am Ida Goodson's Grandson (Daniel Joseph Goodson, III-New Kensington, PA) I will pass this along to my family. Mr. Goodson I would like to talk with you if you get a chance. Beryl Benbow has my numbers. Please call me. Great post. Have you tracked down any more online resources since writing it? I lived in Pensacola from 1980-83. I do not remember the exact years, but during that time period, I used to go to Seville Quarter just to listen to Ms. Ida Goodson play solo on a piano and sing at the "End of the Alley" bar just down the hallway from "Rosie O'Gradys. I remember she was playing something light-hearted and I asked her if she could play some blues, and she smiled and asked,"You mean something from down in the gutter boy"?, after which she really began to play. I loved listening to her play and sing. What a treat hearing her play the blues in person.